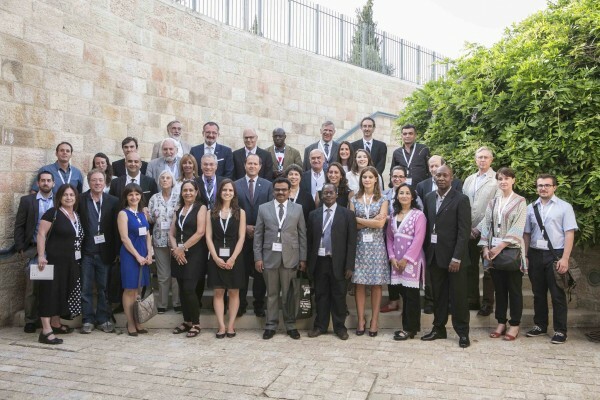 On May 25-27, The Jerusalem Press Club hosted its first conference on Freedom of the Press: Old Commitments, New Challenges under the auspices of the International Association of Press Clubs. Twenty-six countries were represented including Israel, Liberia, Poland, Mongolia, Turkey, Congo, Kenya, Nepal, Gambia, Russia, Kosovo, Germany, France, Spain, India, Argentina, and Malawi. Daniel Pearl was remembered at the opening of the evening. Former Wall Street Journal Correspondent and good friend Asra Nomani, a Muslim woman, spoke of the time when Pearl went missing and was murdered. Jerusalem Mayor Nir Barkat attended and gave opening greetings. A session chaired by writer Irene Prusher, “Reporting from the War Zones” included Georges Malbrunot, a reporter from La Figaro, who was held captive in Iraq for 124 days in 2004. Also on that panel was IDF media spokesperson, Lt. Col. Peter Lerner, Samer Shalabi, first Palestinian journalist to be elected to the Chairman of the Foreign Press Association in Israel, and Chems Akrouf, Director of a safety program for journalists. Gallagher Fenwick, Middle East Correspondent for France 24 watched the clip of his report from Gaza last summer. It showed the segment interrupted by a Hamas rocket while he was on the air. The clip ended with Fenwick pointing to the UN flag on the building next to the area from where it was launched. “The New Journalism: How Digital Media Changed the Rules” was chaired by Dr. Tehila Shwatrz Altshuler and the speakers were David Horovitz of The Times of Israel and Paul Egglestone from the University of Central Lancashire, UK. Editors Aluf Benn, Haaretz, Andrea Rizzi, Spain, Sebastian Lacunza, Argentina, and Souheil Karram, Al-Shams Radio spoke at a session chaired by Jodi Rudoren, Jerusalem Bureau Chief, New York Times. Discussions of Charlie Hebdo, the French publication and the murders at the magazine, were in a session with Solene Chalvon and Eva Illouz, and arose in other conversations on the role of the media in sharing information.